This card cannot be Special Summoned. You can Tribute this card to add 1 "Zombie World" from your Graveyard to your hand. 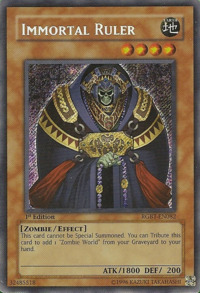 This card may be a counterpart of Revived King Ha Des and Dark Ruler Ha Des based on this monster's similar-looking robe compared to the two, the fact that it cannot be Special Summoned and this monster's name. Zombie World appears in the background of this card's artwork. This is one of the few Zombie-type monsters that cannot be Special Summoned. Indeed, this is ironic, as this card has the word Immortal in its name, which overtly insinuates immortality. The symbols that are emblazoned on this monster's robes and trims appear to be of a Celtic design.